Watching the Watchers - Join the debate! The privacy and security debate wouldn't be a debate if different voices don't join it! Here's your opportunity to share your thoughts and comment the articles you've read! Got a burning question to ask? A funny story to share? Fears? Information? Are there security measures you think heavily violate our freedoms? 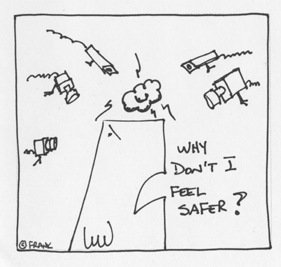 Does surveillance make you feel safer? Does surveillance make you indifferent and you think you've got nothing to hide? Camera surveillance situation in The Netherlands: Some points of considerations in this article. European Union surveillance research:what is being funded and who is involved in it? Discover more here! Explore Data protection laws here. Then deepen the knowledge through a law expert's considerations in this inspiring interview. A survey has been conducted in order to investigate public opinion about surveillance, security and behavior around surveillance cameras.Have a look. Also, read more about some real life crime cases solved thanks to surveillance cameras, in this article.